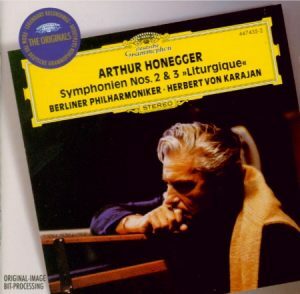 At the very least, as with his belated exploration of Mahler (begun with the 5th Symphony in 1973), Karajan’s embrace of Honegger brought to the composer a whole new audience that would never have bothered with Tzipine, Munch, Ansermet or Baudo. With them, Honegger was just some modern French composer of angular and dissonant music that one couldn’t be bothered with; with Karajan it became respectable and worth a try – and, as the French say, “l’essayer c’est l’adopter“, to try it is to adopt it. 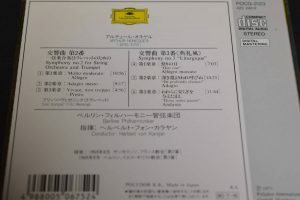 Still, I wonder if Deutsche Grammophon’s belated release – recorded in 1969, the two symphonies were published only in 1973 – reflected the label’s faintheartedness about their potential success. 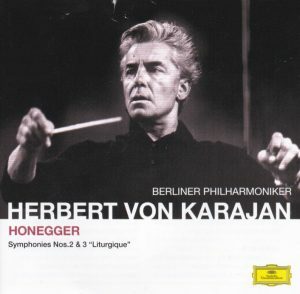 But Karajan’s encounter with Honegger has earned him such quasi-universal accolades (the erstwhile Fanfare critic Royal S. Brown, in the late 1980s, is the only one I read who was more negative) that the risk is to listen to the reputation rather than the recording. 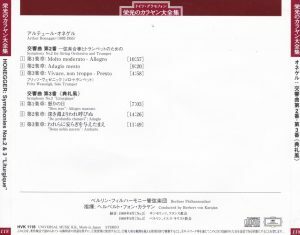 So, do Karajan’s recordings of Symphonies Nos. 2 and 3 truly deserve the effusive praise if not worship they have received since they came out in 1973 and still do from all quarters, especially in view of the existing competition? Not without a few reservations. There is nothing outlandish in Karajan’s tempo choices in the Second Symphony‘s first movement, he follows the “tradition”, or at least one of them when he takes a very brooding and very beautiful opening “molto moderato”, as Baudo (1960, first installment in his traversal of the complete symphonies on Supraphon with the Czech Philharmonic) and Ansermet (1961, first CD reissue on Decca / London “entreprise” 430 350-2) had done before him, straying here from the more urgent model established by Munch in 1953 in Boston (RCA GD 60685 wtih Symphony No. 5 and Milhaud’s La Creation du monde and Suite Provencale – but Munch’s premiere recording, made during the war with Orchestre de la Société des Concerts du Conservatoire, was also spacious in tempo). But that Karajan’s interpretation is not just the interpreter alone facing the score, but also having listened to the recordings of his predecessors, is shown in the huge rallentando he applies between 5:25 and 5:35 just like about everybody else since Munch (but not Izler Solomon in 1952 conducting the M-G-M String Orchestra on LP M-G-M E3104 not reissued on CD), almost grinding to a halt, where Honegger indicates only “poco rituenuto”. It puzzles me that everybody here should follow the lead of Munch (and sure Munch had unique authority for having worked directly with the composer; but he often strayed from the scores’ tempo indications) rather than the score. Karajan’s sonics are spacious and superb also, silky and surrounding, and there is great intensity in the climaxes, as the one building from 6:40 onwards, and also a great transparency of textures, as at the “poco meno mosso” passage at 7:28, where the staccato accompanying figures of violins and violas are beautifully heard. But some details don’t come out as clearly as they should. In particular, there is an important rhythmic figure, a zipping 16th-note followed by an eighth-note triplet, first played (once) by violins (at 3:13) then by cellos, repeatedly (first at 3:17), then joined by double basses, that gives a biting underpinning to the melody flowing from cellos to violins (it returns later also). 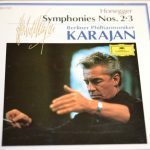 With Karajan and DG’s sonics, the figure played by the violins is barely audible and when played by cellos and double basses, it’s there, surely, but blurred, slightly muddy, lacking crisp articulation and bite. Another problem with Karajan’s first movement is that, after the beautiful brooding introduction, when comes the Allegro section at 2:28 (the movement constantly alternates between both tempi and moods), Karajan comes nowhere near the bite and raging fury of Baudo or even Munch. Compare with Baudo at 2:32, the difference is breathtaking: Baudo’s cellos and double basses are crisply and vigorously articulated, biting, menacing, Karajan’s sound thick and heavy. And it’s not just there: as often the Austrian conductor favors a thick bass texture at the expense of crispness and bite, and in Honegger, it is a loss. This is related to the way Karajan treats Honegger’s bass line in those allegro passages: as a bass line, precisely, a harmonic underpinning. I think it is a misconception: in the Second Symphony’s lean textures, it should be treated as a Bach-like counterpoint, as clearly and crisply articulated as the violin melody. In the first movement, each in their own way, I find Baudo, Plasson on EMI (both very similar to Karajan in their choices of tempos), Munch (very different, urgent and fiery) and Rozhdestvensky (on Olympia OCD 212 or Melodiya MCD 212, very deliberate, but with great bite of attack) all preferable to Karajan. No such reservations with the two other movements. 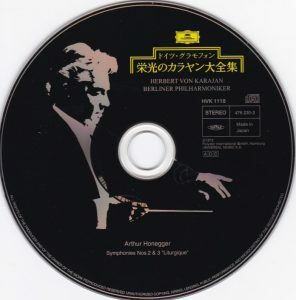 Karajan’s very slow slow movement was very unique when it came out (compare its 9:15 to Munch‘s 7:48 with Orchestre de Paris in 1967, or 6:55 in Boston, or to Baudo‘s 8:38), less now (Plasson and Zinman on Decca have conducted even slower ones since), but still uniquely intense and the high point of his interpretation, played as a heart-wrenching and moaning dirge. But again the double basses between 4:56 to 5:21 are muddy, reduced to a mere rumble. The Finale may not be as urgent and biting as Munch‘s in Boston in 1953 (Munch in Paris in 1967 is much more held-back), but other than that version Karajan is third to none in terms of urgency and bite (although Baudo comes close), and I hold it in his favor that his trumpet, when finally it plays in the final bars (at 3:56), should be so blended with the violins’ texture. 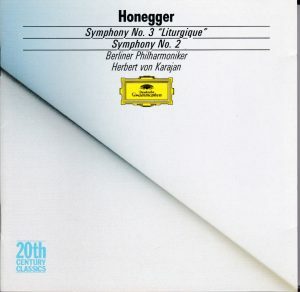 It makes sense to have, like every other versions, a more prominent and brilliant trumpet (like the ray of light erupting through the clouds), but Karajan’s choice is much more faithful to Honegger’s original intention: in the composer’s own words, “to sustain the ending chorale I indicated an ad libitum trumpet. This is not an effect, it is only a support for the first violin melody in long note values, that runs the risk of being submerged by the polyphony of the other same-timbre instruments“. However, again, because of sonics sometimes favoring mass at the expense of clarity, some accompanying figures don’t come out as distinctly and vividly as I wish they had. Karajan’s Symphonie Liturgique is a great recording, but with a small “but”. Of the first movement, “Dies Irae”, Honegger wrote that it depicted “the day of wrath, the explosion of force and of hatred which destroys everything and leaves nothing but debris and ruins. The hurricane sweeps everything away, blindly and angrily. For the listener there is no time to breathe or think…” For the anger, the breathless fury, the raging urgency, go to Baudo with the Czech Philharmonic in 1960 (see link above) or to Mravinsky live with his Leningraders in 1965. Mravinsky’s brass are much more crude, brutal and raw than Karajan’s – and they should be. Recent versions with the same sense of breathless urgency are Järvi‘s (Chandos 1992) and even more Jansons (see link above). Karajan’s first movement is great, but it is a “Dies Irae” for the layman, for a listener that must be handled with care, one that might balk at too much anger, rage and fury; it is a movement that leaves the listener time to breathe and think. That being said, the rest is great, period, although it deserves commenting to explain why. Am I the only one to find that the Liturgique’s slow movement very problematic, one of Honegger’s weakest inspirations? The composer himself said it had given him much trouble, trying as he was to develop a melodic line without using the customary methods and formulas, one that would “go forward without looking back“, extending “the intial curve without repetition or stops“. 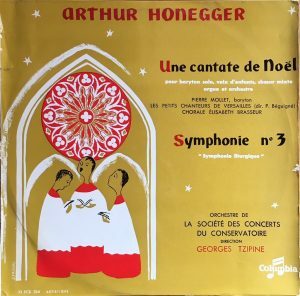 But where Mahler masterfully succeeded, especially in his 9th symphony (I’m mentioning Mahler because looking at the way the music is laid down on the score, it looks very much like a Mahler orchestration), to my ears Honegger fails, because his material and moods sound naïve and tritely pastoral in the manner of the Christmas Cantata (“how hard it is to put a prayer without hope into human mouths“), making the movement seem overlong and diffuse. 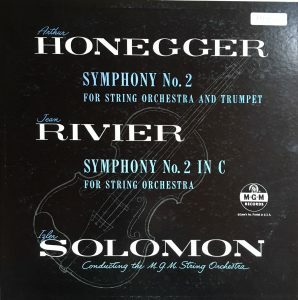 And when Honegger recorded his Symphony in circa 1947 (it has been reissued by Music & Arts and Alpha, see my reviews), he made matters even worse, by taking a tempo close to ten beats slower than his indicated metronome mark of 54 quarter-notes/mn, making the movement seem like a staid, endless and aimless unfolding of nothing. The only approaches that seemed to work and make the movement sound better than it is, were those of Munch (live with the Boston Symphony in Prague in 1956, a recording that was made public only in 1990, on Multisonic 31 0025-2) and Mravinsky, because they took a more flowing pace, and animated the short climaxes to great intensity. And that Munch even practiced a small cut did not harm either, keeping the movement under 10 minutes (Mravinsky took it uncut in 10:43, to Honegger’s 13:32). So just looking at Karajan’s timing – 14:23! – made me recoil at the thought of the tunnel of boredom I was going to face. In fact, I find that it works. His calm, expansive, majestic unfolding, with great intensity in the climaxes, not through any acceleration of tempo like Munch but simply piling of dynamics, hasn’t convinced me any more than I was of the music’s greatness, but I think it makes it, as the Munch/Mravinsky approach but on the opposite pole, as convincing as it can get. But the truly great is Karajan’s Finale, and you need the historical perspective to know exactly why. The movement begins with a nasty and ominous march depicting “the implacable rise of man’s enslavement, of the total loss of his freedom … the march of robots against civilized man, holder of a body and a soul“. Honegger wrote a startlingly slow metronome mark of 88 quarter-notes per minutes – and he himself conducted it much faster, closer to 100, in his own recording. From then, the interpretive paradigm – followed, from 1955 to 1965, by Tzipine (LP EMI Columbia 33 FCX 336, not reissued on CD), Munch, Baudo, Mravinsky – was to take it as a flowing march, Mravinsky being the fastest at 116, Munch opening at circa 112 but accelerating even more in the course of the movement, to great and fiery effect. Honegger’s biographer Harry Halbreich mentions a manuscript performing note in which Honegger suggests a tempo of 112. Still today most versions take it as a quick march, the most extreme being Jansons, at a phenomenal (and very effective) 124. 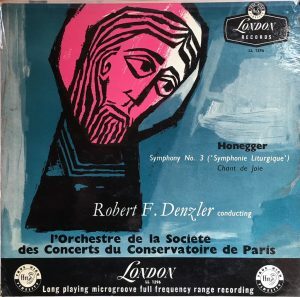 In the mono era, only one version strayed from the universal norm, a forgotten great performance which I still have on LP, recorded by Robert Denzler and Orchestre de la Société des Concerts du Conservatoire for Decca in 1955: they took it exactly at the score’s metronome indication. [Edit February 1, 2018: Denzler’s version had been transferred from the LP to CD by the French label Forgotten Records. 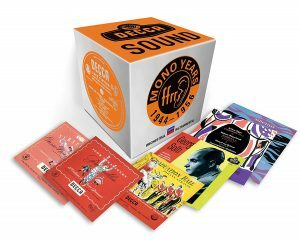 It has finally officially been reissued to CD in 2015, on Decca’s mammoth 53-CD set “The Decca Sound – The Mono Years 1944-1956”, 478 7946, barcode 028947879466 – which was reason enough for me to buy it (there were also other reasons, fortunately)]. In the stereo era, only Ansermet, a year before Karajan, moved back in the same direction – but only a few steps, circa 98. Karajan? Like Denzler, he’s dead on 88, and the effect is great: one of frightening implacability, conveyed not just by tempo, but also by the massiveness of his orchestral dynamics, the instrumental bite of every orchestral section. In view of that, that a cello counter-melody is so drowned under the resounding resonance of the horns between 1:30 and 1:56 as to become inaudible is a very small matter. The symphony ends with the “glimmer of hope”, at 7:55, and predictably the Berlin strings play it beautifully (making it sound almost like an Ondes Martenot, which is perfectly appropriate, being an instrument that Honegger used in “Joan at the Stake”), but Karajan further ends with a beautifully personal touch: he has the piccolo, playing the “bird-theme”, the reminiscence of the Dove of peace, sound from afar. It’s not indicated in the score, nobody had done it that way before, it is a great touch, very true to the meaning Honegger wanted to convey: “the symphony ends with an – alas! – utopian evocation of what life could be like in brotherhood and mutual love“. So: great performances then? Ultimately, yes, although not without a few reservations. And not versions that give the full and only possible picture of both works. 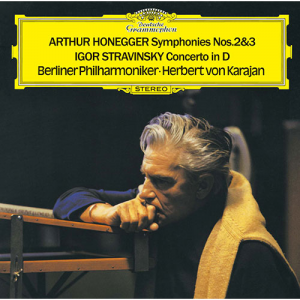 In the Symphony for Strings serious amateurs of Honegger should complement Karajan at least with Munch (his last recording with Orchestre de Paris) and Rozhdestvensky (very personal), and if they are really really serious they can add Baudo, Plasson and Munch in Boston. For alternative and equally valid approaches of Liturgique, don’t miss Mravinsky, Järvi or/and Jansons, and also Jean Fournet (Denon), for his truly unique Finale, even more radical, e.g. radically slow, than Karajan’s. These recordings, first reissued to CD in 1988 on DG’s “20th-Century Classics” collection, have been reissued in 1995 on their “Originals” series with the complement of Stravinsky’s Concerto in D for strings. Complementing Honegger with Stravinsky’s Concerto isn’t as coherent as if it had been, say, “Pacific 231” (as with Jansons) but it makes sense: it is, like Honegger’s Symphony No. 2, both a work for strings alone and a commission and premiere by Paul Sacher (but from 1947, on the same occasion as Honegger’s Fourth Symphony, “Deliciae Basilienses“). And not coincidentally, it was recorded shortly before the Honegger Symphony, in the same venue (the French Church in Saint Moritz). As with his Honegger, Karajan’s Concerto in D is a very idiosyncratic reading, but here I find that the Austrian conductor crosses the threshold where personality becomes distortion. Typical of Karajan’s way is the first movement section starting at 2:10, notated by Stravinsky “moderato”, after the “vivace” opening, but with a metronome indication that shows that each beat (in a 3/4 simple meter) should be the same as the compound-meter beats of the previous section. Karajan doesn’t observe, his beat there is markedly slower than his previous tempo, and the character he brings to the music is languid, coy, making it sound like Strauss’ Rosenkavalier. Figures speak: Karajan takes the section in 1:59, to Stravinsky‘s 1:16 (in his stereo recording with the Columbia Symphony Orchestra), or Colin Davis‘ (with the English Chamber Orchestra in 1962, CD-reissued on Decca Entreprise, barcode 028942562226), far from a Speedy Gonzales, 1:24. In the next section, “con moto”, at 4:09, which can sound and has sounded under other batons with so much explosive drive, Karajan goes for weight and power rather than bite and propulsion. Ultimately, this is the longest running first movement I’ve heard, and by a margin. String textures are thick, basses lack definition and trenchant, this is definitely a reading for big orchestra, not the Basel Chamber Orchestra of commissioner and premier performer Paul Sacher. None of these observations are necessarily meant as criticisms. Karajan’s approach is certainly not “the norm”, it is a reading from and with a big personality. Whether the personality suits the music, or reveals other and interesting facets of the music hitherto concealed, is anybody’s judgment. The middle Arioso can take the “all charm” approach better, it is precisely what its about, but what is not open to subjective appreciation however, is that the movement is written as a duet between violins and cellos sometimes even playing the same melody in contrary motion, which every version I’ve heard, including Stravinsky‘s first in mono (1950 RCA), brings out clearly, and which Karajan gets badly wrong: he plays it as a cantilena for violins with string accompaniment, without a score I’m not even sure that anybody will hear that there is a cello melody running parallel. Frankly, and disappointingly, Karajan’s string textures sound like mush. Just listen to the two chords at 1:18. This Sacher Torte (! I doubt that this is the offering to Sacher Stravinsky had in mind….) is so thick and heavy no-one will digest it. This is no more Richard Strauss but Johann, and there’s only this much Strauss Stravinsky can take (and probably Strauss as well). Likewise in the Finale, you can hardly hear the solo cello from between 0:47 and 1:06, because it is entirely covered by the stridently played accompanying staccato figure of violins. The double-bass pizzicati throughout sound with such a long resonance that you could almost mistake them for gongs. That said, I’m not entirely negative with Karajan’s Finale. What it loses in instrumental trenchant it gains in power, and though Karajan paces it dynamically enough, his celli have a silky texture that makes them sound almost like a funeral lament (try from 0:24 onwards): different, but not uninteresting. And very Honeggerian, too. 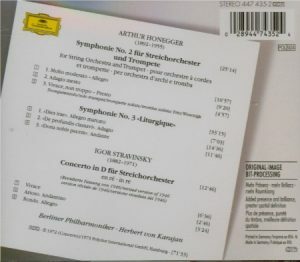 The Stravinsky Concerto in D was originally published on LP with the Symphony in C and Circus Polka – certainly an unexpected repertoire for Karajan (see the LP’s entry on Discogs.com). 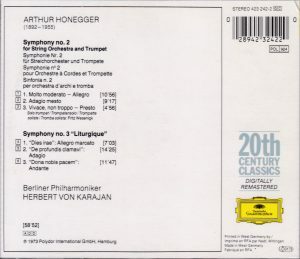 Both the Symphony and Concerto were already reissued on CD, in 1988, on another installment from DG’s “20th Century Classics”, 423 252-2, barcode 028942325227, but paired with Karajan’s 1975 recording of Symphony of Psalms, and my own preferred choice is to have both the Honegger and Stravinsky “20th Century Classics” CDs rather than the reissue on “The Originals” . The 3-minute Circus Polka found its way on a 2-CD Stravinsky compilation from DG featuring different conductors, barcode 028946920527, and on a single Stravinsky CD from DG’s budget Classikon collection, barcode 028943946322, as a complement to Karajan’s Apollo and Charles Dutoit’s Petrouchka.